MobiFone is rapidly evolving from a telecom company to a multi-service provider and is applying Internet of Things (IoT) technology, conference hears. 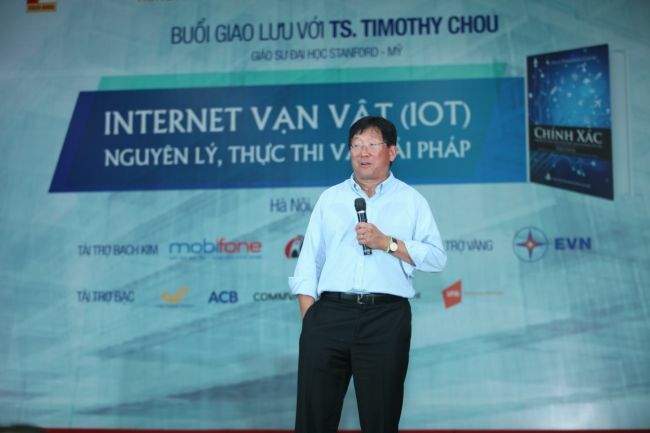 “The Internet of Things: Principles - Practices - Solutions” conference, chaired by Dr. Timothy Chou in Hanoi on May 4, revealed new opportunities for many enterprises in Vietnam. In an article on the fourth industrial revolution (Industry 4.0), Professor John J. Vu, Director of the Carnegie Mellon Institute of Biotechnology, said that by 2020 there will be 50 billion devices connected in the world, such as smartphones, smart homes, smart cities, self-driving cars, smart plants, smart robots, and so on. The combination of the physical and digital world is the essence of the fourth industrial revolution, a powerful force that will affect everything, every company, and every country. The market value of the Internet of Things (IoT) is estimated at $11 trillion and it also can provide approximately 12 million new jobs globally. The IoT market may be bigger than the PC, mobile phone, and internet markets. While the PC market created Microsoft, the mobile phone market created Apple and the internet market created Google and Facebook, so new leading companies in the technology world will emerge. Who these companies are is still to be answered. Whoever controls the IoT market, however, will lead the fourth industrial revolution. Industry 4.0 in Vietnam is a new term and it seems to be relatively confusing. The IoT, which is happening in front of us, around us, and is spreading out in Vietnam, is a part of the fourth industrial revolution and is very close to us. Some hospitals in Ho Chi Minh City and Hanoi have performed surgery with the help of robots. Moreover, the IoT is now being applied in other technologies such as smart homes, intelligent cities, smart health, intelligent transportation, and so on. Mobile network operators in Vietnam are not outside of the trend. MobiFone is rapidly evolving from a telecom company to a multi-service provider that provides solutions for mobile phone users and enterprises through telecommunications infrastructure and the internet. MobiFone is not only a telecom provider but has become a multi-services corporation with four pillars: Telecommunications - IT, Television, Distribution and Retail, and Multimedia and Value Added Services. As one of the leading technology companies in Vietnam, MobiFone has applied IoT technology in new products such as TioKid and MobiTrack. TioKid is a smart watch for children, a fashion watch as well as a mobile phone. This smartwatch integrates a GPS tracker that helps parents control and communicate with their children anytime, anywhere. MobiTrack is an itinerary monitoring solution that helps transport enterprises track down staff’s location and hence enhance productivity as well as minimize costs. In order to contribute to the business environment, as well as Industry 4.0 in Vietnam, MobiFone had worked with Dr. Chou to share methods that help Vietnamese organizations and enterprises gain a better understanding of the IoT framework, technology and solutions. The author of “Precise” also presented IoT trading solutions as future business opportunities for enterprises to prepare strategies and business development plans. Representatives from MobiFone asserted that the company believes that the presentations from Dr. Chou will facilitate Vietnamese businesses to envision the opportunities to connect with the world and manufacture IoT products based on the strengths of each business.